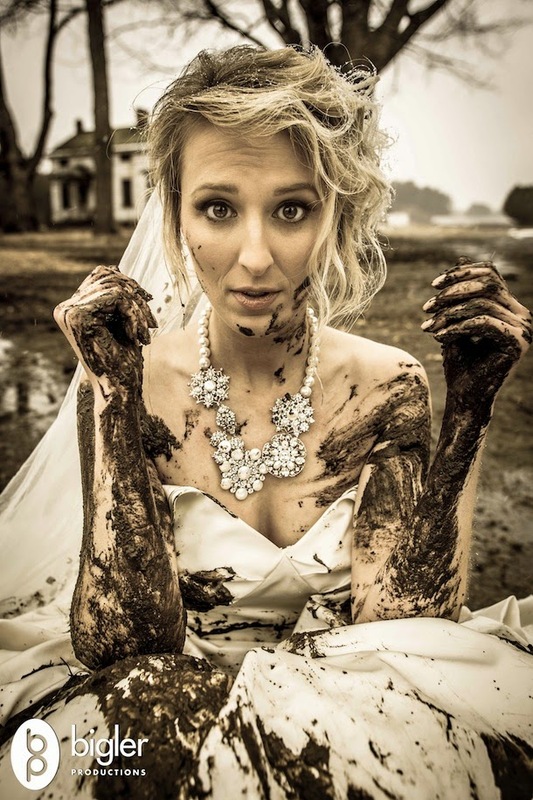 You only wear your wedding dress for one day, so why not Trash It and create amazingly Over The Top wedding photos? 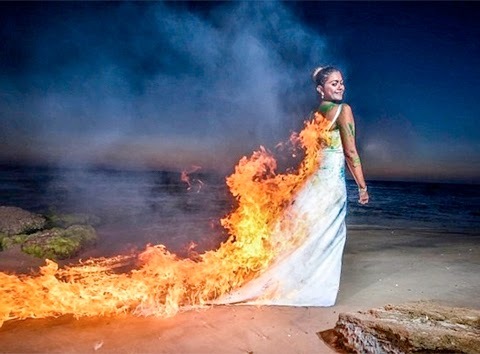 These brides went above and beyond the traditional wedding photos and trashed their dresses to create unforgettable images. How do you trash a wedding dress? Well maybe not really light it on fire (let Photoshop be the pyro), but you can make it look like your love is so hot, it literally ignites. Just tell everyone you wanted a creative/dramatic rendering of your inner child. Get your husband involved and let him express his artistic side. 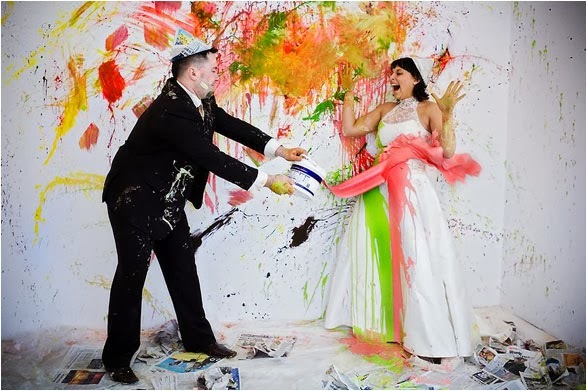 ...Or go for the more exciting Squeeze Bottle Paint Fight! All is fair in love & war. *Photo courtesy of Chesler Photography. The beach makes a perfect location to trash any beautiful white wedding dress. Dive in and create amazing underwater photos. *Photo courtesy of Del Sol Photography. 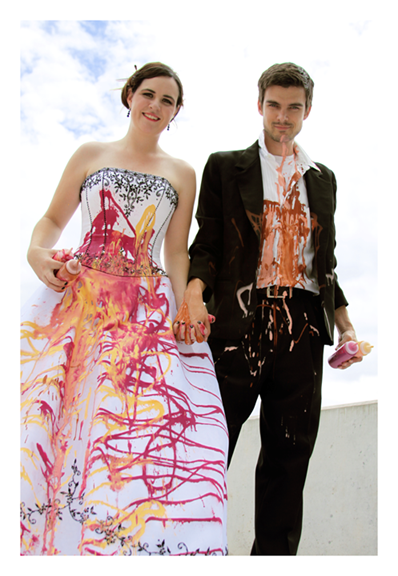 Combine all your favorite Trash The Dress trends..Wear it to the Ocean, Cover it with Paint, & let Photoshop Light It On Fire! 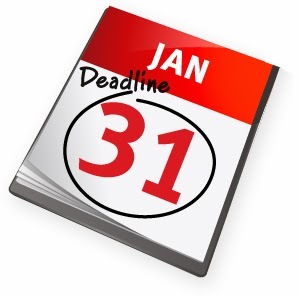 The team at Inspherio would like to remind you of the upcoming Jan 31st Deadline to have W-2s & 1099s to recipients. Our sister product, ExpressTaxFilings.com can help you quickly and easily generate and file W-2s & 1099s with the IRS. How do you know if you should file a W-2 or 1099? The simple answer is if you have employees and have withheld taxes, you would issue a W-2. For independent contractors who were paid $600 or more and no taxes withheld for the 2013 tax year, you would issue a Form 1099. Want to know more about ExpressTaxFilings.com? ExpressTaxFilings.com is the premier online filing program for 1099s and W-2s. We are IRS authorized, and our experienced unmatched U.S based support team is here to ensure you to have a stress-free filing experience. Great! Their US-based support team located in Rock Hill, South Carolina is always available to help you with any problems you might have. You can reach them by phone at 803.514.5155 or by email at support@ExpressTaxFilings.com. If you saw this amazing art piece at a wedding, would you know it was the wedding cake? This over the top edible sculpture was created by Chef Omar Addihaoui - Cafe Opera. Photo courtesy of tripntale.com. Put in the time to set up your account properly. Jot down what you think you will be using your account for to act a guide. Make sure to include keywords in your description. Don’t forget to set up the links to your website and social media channels on your profile so viewers can move seamlessly between platforms. Integrate all your social media platforms. You can easily add Pinterest sharing buttons and apps to other social media platforms, such as Facebook. Call-to-action words are great to add to your Google+, Facebook, Twitter, YouTube and LinkedIn to gain more followers on your Pinterest page! When setting up your initial boards, choose topics or categories that reflect your business values, culture, interests, products and services. Be Copyright Smart. Read the fine print first. It might take an extra few seconds, but it adds a degree of credibility to your page.Always double check the source of the Pin. This is very important. When re-pinning, click before you repin to see if pins are sourced from a legitimate website. If content has been “re-sourced” with a false URL to another site, you shouldn’t repin it. Pin across a range of boards. Add pins gradually, and create new boards as you feel necessary. Be creative with your board names, captions and pins. Follow, Follow, Follow. Start following users and/or individual boards that are of interest to you. By following and engaging with users and repinning their content, you will begin to build your own community of followers. Space your pins. Don’t do a pin dump! Pinterest is unlike Facebook and Twitter where the feed-time is limited. Pins will remain in view for days or weeks due to the cyclical nature of their exposure. Pinning for a few minutes a couple of times per day is enough to get you started. Time your pins. Take note of the times when your fans are pinning - be flexible, and if all else fails, 2:00-4:00 PM and at night are popular for pinning according to Pinterest. Comment and Like. Just like you would socialize on Twitter, Facebook, YouTube or Google+, be sure to comment on, and Like, the pins of other users and businesses. Use Names and Tags to make your page more personable. Use @tags to notify the user you are engaging with. Hashtags (#) are used to highlight keywords that will lead viewers to your page when searched. By using names and tags, you can stand out among the large majority of Pinterest users and create engaging boards. Remember to Say Thank You. This is a forgotten art on Pinterest and other social media channels. Regularly check your Re-pins and visit the boards of people who have repinned your content and make the effort to thank them for repinning. Just like RTs on Twitter, or Shares on Facebook, the Re-pin is a valuable thing. Choose great images for your boards. Having interesting, engaging, quality images will most likely get your content repinned. Include photos, infographics, videos and text. Don’t forget that text is important to accompany your pins. 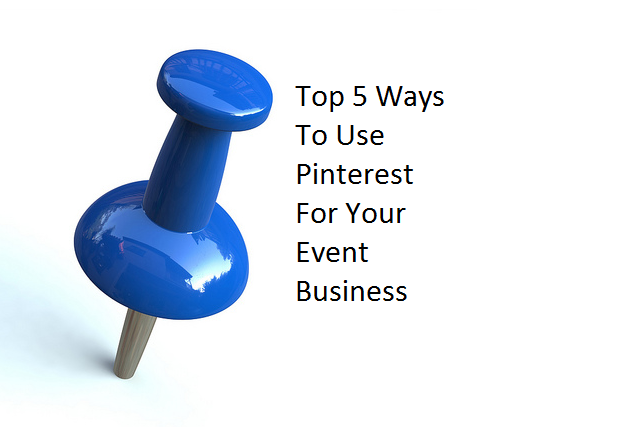 Make pinners want to click on your pin by making them simple, visual, and clear. Experiment with size by mixing in taller pins to give your board a visually appealing look. Multiple websites, newsletters, and even apps provide event industry professionals with up to date information on the latest trends and business tips. For the wedding industry in particular, Wedding Network USA is a great resource for wedding professionals to know what is currently happening within the industry. They offer expert opinions, updated resources, and local educational seminars where the wedding community can exchange ideas and network with other wedding professionals looking to better their business. Among their BizBoost Resources, you will find Michelle Loretta & Kelly Simants of Sage Wedding Pros. These talented women help small business owners in the wedding industry with their business planning and financial analysis. Charles Oster of mywedding.com lends his expertise, as does wedding industry veteran Alan Berg, who serves as an Education Guru for WeddingWire. A complete list of their, and other expert wedding professionals, advice and information can be found on Wedding Network USA’s BizBoost Resources. Let us not forget about Inspherio, another BizBoost Resources. We’re here to help wedding professionals save valuable time managing their business and more time focusing on their clients. All Wedding Network USA members receive a special offer for Inspherio. We are excited to be working with Wedding Network USA and look forward to helping wedding & event professionals flourish in 2014. Simply setting out a large trays of finger food lacks that “Wow” factor, take a look at these food presentation trends that not only look great but can become an entertaining feature at any event. 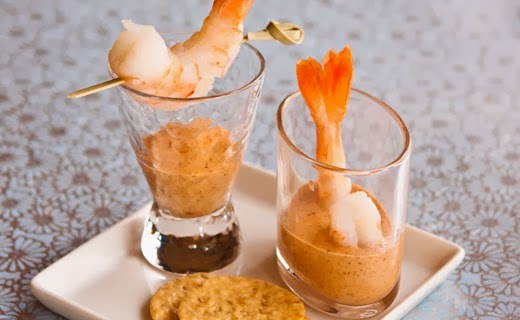 Presentations with alternative containers - serving soup in a plain bowl doesn’t look exciting, amp up any soup recipe by simply serving it in a test tube or tall shot glass. 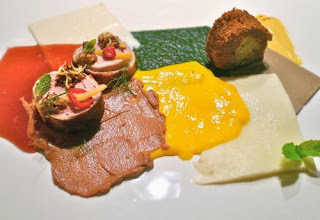 Free Form Plating - This type of presentation pays homage to modern painting styles. Placing a dish in an abstract way on a plate may seem careless at first glance but much thought has gone into it. Using different sauces to add color is not only pleasing to the eye but gives multiple options for entertaining the taste palate. 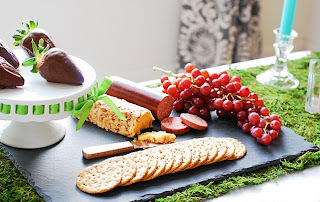 Presentations using organic materials - Using materials such as wood, stone, or slate lend a natural element to any dish. An added bonus of stone or slate is that they can trap heat to keep food warm, or be refrigerated and stay cold for hours to keep certain dishes nice and chilly through an entire event. 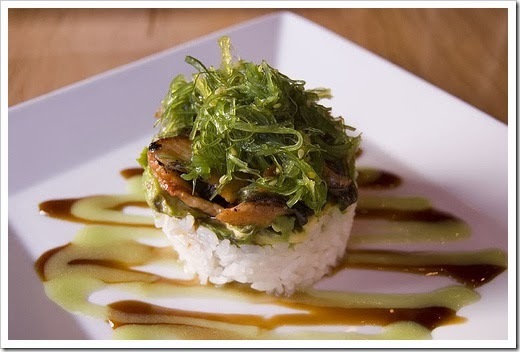 Landscape plating - This particular presentation style takes cues from the natural world around us. Particular landscapes or gardens that are related to an event can become inspiration to entertain guests of all ages. Everything is better in a shot glass - Appetizers are great, especially with different sauces to pair them with, but it can be a bit messy. 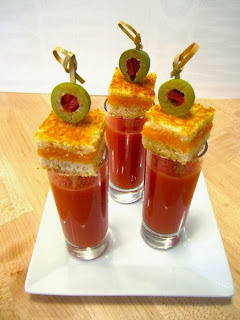 By utilizing a shot glass and placing the dip in the bottom and securing the appetizer on top is not easy to dip but also a very unique presentation of a simple dish.